​The last stop for the day for thecity.ie was the MART gallery in Rathmines and here we found a collective called We Occupy Space exhibiting in the gallery. The collective is made up of four artists, Yelverton Freeman, Kate McElroy, Ciaran Nash and Isabella Walsh. When talking to Kate McElroy about the group she explains that they formed in Limerick when they were exhibiting in gallery called Occupy Space. “[We] lost the space three days into a exhibition, so we starting finding other disused spaces around the city [and]from that four of us applied for this show in the MART. ​“We Occupy Space is kind of an ever-changing entity and we decided to work together as an artist collective,” Kate said. Kate has two pieces in the exhibition in the MART, and the first is called Dissolve 1, Dissolve 2.She explained how the work was created: “[They’re] two photographic pieces printed onto tracing paper. And so the images are really faded, they’re kind of dissolving or blending in with the background. And so the process of this durational piece is integral to the idea and what it is supposed to symbolise. Kate is displaying the effort and energy that we put into ourselves and we force ourselves to grow by pushing our mind to its limits. Above you will find images of the first day of this process. In the next section of this article by Jack Popeley you will see the next step of the process and images of the performance piece by Kate McElroy. At the MART gallery on the second day of the Dublin Gallery weekend we returned to the MART to talk Ciaran Nash about his piece ‘Occupy Something, Somewhere’ which you can see in the slideshow above. “I was kind of meditating on what Occupy Space was and what it could be and also what it wasn’t. I tried to get as many things as I could that made some narrative sense,” he said. Nash then rearranged them to speak a message that he wanted to say, but also to keep it broadly objective. 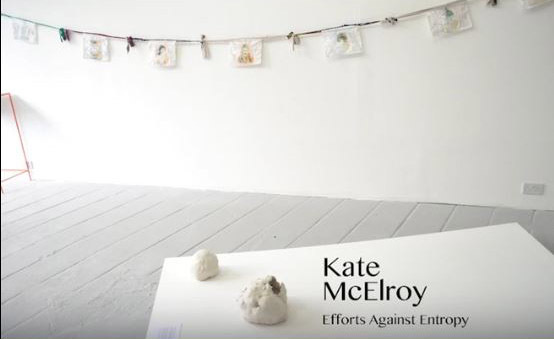 You will also find in the slideshow above the next process of Kate McElroy’s durational ceramic piece. And we then watched Kate McElroy’s performance piece which tied in with sculpture work, entitled ‘Efforts Against Entropy’. The piece, like a lot of McElroy’s work, explored the state of the individual, looking at the highs and lows of the self while also examining feelings of oneness and disconnection. It was altogether quite a moving piece, silencing the audience and keeping us glued to the performance.